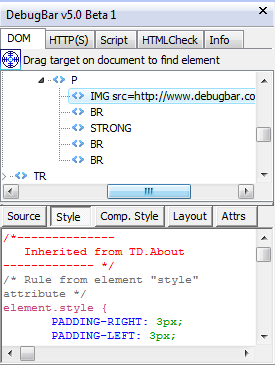 This tab display the HTML document tags tree (the DOM) in the "Document" root entry of the tree. The other tree root entries ("Link", "Images", "Forms", "Style sheets") give you faster access to useful inner document elements. By clicking on the right button over the DOM Tree, you open a menu which gives you the option to "Rebuild the DOM tree". This can be useulf when the web page is changed dynamically by scripts after download. Source : The tag source code will be displayed. Comp. Style : The tag somputed style (that is the resulting style after all the css rules and inline rules are applied) will be displayed. Layout : The tag layout will be displayed. Last but not least, a target allow you to retrieve an element DIRECTLY in the Web Page ! : Click on the target and keep the left mouse button down, then navigate in the page and the HTML element behind the target will be flashed. When you release the button, the last selected element is selected in the DOM tree and all its attributes are displayed !